After a young cook went into cardiac arrest in his kitchen, Brandon Jew is making it his mission to get every restaurant worker in America CPR certified. 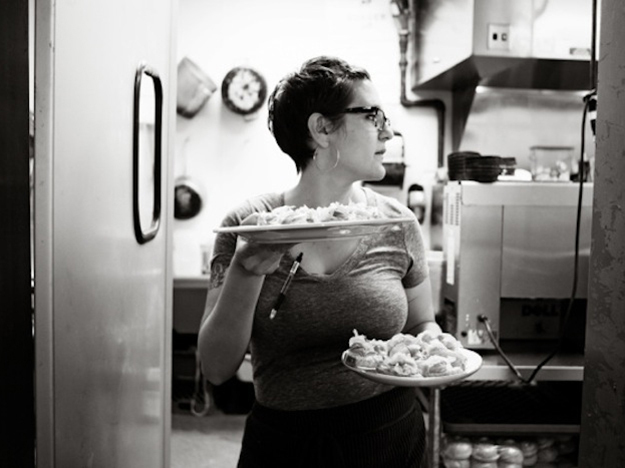 Editor’s note: In November, we launched Communal Table, a forum for amplifying first-person voices in the food industry. Our goal is to work long term with leaders to create more humane and sustainable workplaces. We encourage restaurant and bar workers and owners to write in and share their experiences here: kat.kinsman@meredith.com. Have ideas about how to make the industry a safer, better, more sustainable place to work? Please share them, too. We’ll edit and post some entries to foodandwine.com. Brandon Jew is the executive chef and owner of Mister Jiu’s, a contemporary Chinese American restaurant in the heart of San Francisco Chinatown. Mister Jiu’s combines the local, seasonal and organic bounty of the Bay Area together with classic Chinese techniques and flavors. The restaurant celebrates its place in the historic neighborhood working to evolve and define Chinese American cuisine in the Bay Area. Brandon's honors at Mister Jiu’s include one Michelin star, Bon Appetit #3 Restaurant on Hot 10 2017, SF Magazine Chef of the Year and a James Beard nomination for Best Chef West 2018. As a chef, I pride myself on preparing my team for any circumstance that may come up in the course of a dinner service. I wouldn’t say I am a natural at organization; I'm more of a creative who has had to learn for myself how to best communicate across many departments with many employees that involve many systems. Like most things in my life, it has taken me screwing things up a couple times to make sure it never happens that way again. I have rows of clipboards that form a trail of decision-making for every detail of each station. In lengthy conversations, we go over the nightly service flow. Every inch of the kitchen has a system and a manager to oversee its operation. I have multiple apps I check into daily that update me on the inner workings of the restaurant, as well as project management systems to monitor progress of group planning. The night of December 30, 2017, I was abruptly faced with a circumstance that I hadn’t thought to prepare myself or my team for: how to save a life. Thanks for all the homies who have helped out in this crazy time. Everything from bringing me food, keeping me company, or just sending a text, it all means the world. Having a final surgery today and should be back on my feet by the weekend. Hope to see ya soon! It was a busy Saturday night service during which we were simultaneously preparing for a tasting menu for 175 people the next day. We called our “all-in” around 11:30 p.m., but my sous chefs and I knew we needed a couple more hours of prep to feel properly prepared for the next day. I was filling and rolling tang yuan (a traditional glutinous rice dumpling) with one of my cooks. My sous chef Eric Ehler was portioning 200 pieces of black cod and my other sous chef, Sean, was tying up a couple of pig heads to braise overnight. Around 1:30 a.m., we felt we were in a good place and decided to wrap it up so we could rest up for a busy service the next day. It was New Year's Eve, we were sold out of our ticketed tasting menu, and we had scheduled a deep clean so we could take the next week off and start 2018 with a clean kitchen. I remember discussing some final touches of the menu with one of the cooks, Will. I heard a couple of beers getting cracking, marking the end of a long night. In the corner of my eye, I saw Eric’s knees buckle and him immediately hitting the ground face first. For a split second, I thought he was just over-dramatizing his tiredness, but once I saw blood, I ran over to him. He was unconscious, limp, and not responding. We immediately called 911 and we tried to yell at Eric to stay awake. He was breathing, but it was spaced out and accompanied by a deep groan. Another cook, Christina, took instructions from the 911 operator to perform CPR. I was worried because Eric was no longer breathing and his skin had taken on a bluish hue. We were trying to keep him coherent, but nothing was working and he was getting worse. We saw the lights of the ambulance flashing against the walls of the kitchen and I ran out to tell them to hurry while I gave them basic information about Eric’s condition. I love all of you so much. I came back because my time with you had been too short. Thank you. Much love forever. ❤😢😀🙄👨‍🍳 all the emotions right now. The medics took over CPR, but Eric was not responding. Another team of medics came to offer support. Our team took a step back physically but emotionally we were locked in, standing silent from shock, worry, and at the point of losing hope. The medics took out the defibrillator, they charged it up and sent a shock through Eric. No response. I saw the look in one medics’ eye to the other with despair. They set up the defibrillator again and sent a last-ditch effort at a higher frequency. Eric gasped for air. We all were sent a little bit of relief. The medics took Eric straight to the hospital and we were told his vitals were stable, but in no way was he guaranteed coming back. Over the course of the week, while Eric was in a coma, I questioned a lot. Was I too hard on him? Was I to blame for the amount of stress that might have caused his heart attack? If I knew CPR could that have saved him? Did I do enough to feel I did all I could during the emergency? How could our kitchen move on? I think for every cook, the work-life balance swings front and center at some point. In an attempt to justify our sacrifices, we reconcile contentment with our training and accomplishments. Sometimes the relentless pursuit of our own culinary education doesn’t make sense to the people around us. I had come to terms with my own sacrifices, but now I was being confronted with my role in the employees under me. Luckily, before I got too deep into the abyss of "what if’s," we were notified that Eric awoke from his coma and that he was improving each day. He actually was getting restless after a couple weeks in the hospital and itching to get back to the grind of the kitchen. He had surgery to install a defibrillator into the side of his chest and came back into our lives and the Mister Jiu’s kitchen as lively as ever. His recovery is the most miraculous event I have ever witnessed. It’s still hard for me to believe, even to this day. On Dec. 31, a 29-year-old S.F. cook named Eric Ehler suffered a cardiac arrest. He died. And then awoke. Eric’s dedication and commitment to our kitchen and to the craft of cooking has been inspiring to us all. Something that has propelled us past the fright of that night and reminds us of how much joy comes from working within a team and cooking food together. Just like learning from my many previous mistakes in the kitchen, I am determined to never let this happen again. Not having someone prepared to administer CPR in our kitchen is no longer acceptable and hopefully will not be in any other kitchen in America. Beginning this June, we will be hosting training sessions at Mister Jiu’s to get chefs CPR certified. Our goal is get every kitchen in San Francisco educated with the ability to act in a moment of crisis. If you run a kitchen or a restaurant, I hope you too will prioritize a training session for your staff to become CPR certified—because you never know when you may need the people around you to save you.